Virtual Kitchen Stadium, Iron Chef Style! The cookoff begins tomorrow, June 30th at 10am CST, which is when the secret ingredient will be revealed. Cheftestants will need to use the secret ingredient to create an original recipe. The recipe will be submitted to RedEye, along with pictures. 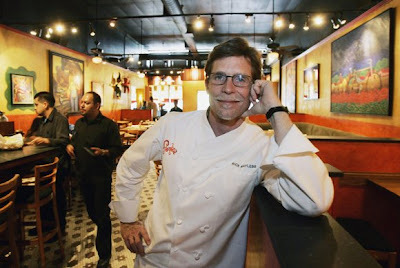 Judging the recipes will be Chef Rick Bayless... who will also announce the winners on Thursday! Week 1 - Four of the 8 cheftestants are chosen and cook against each other. Two winners will move on to round two. Week 2 - The remaining four cheftestants cook against each other where two winners will move on to round two. Week 3 - The 4 winning cheftestants move on and cook against each other where two winners will move on to the final round. Week 4 - The remaining 2 cheftestants battle it out for the title where only one will reign supreme! I happen to be one of the lucky 4 battling it out this week for Week 1... so wish me luck! To read more about my fellow competitors and to follow along with the event, check out Chicago RedEye's blog. For all those Twitter peeps, you can also follow me (@ItsJoelen) and the cookoff (@redeyemunchtime) on Twitter for minute by minute accounts of the cheftestants! Joelen - this is so exciting and is the perfect challenge for you. I know you will do great and you have all of us cheering you on!!!! Good luck! Wow, how neat! I hardly ever read the Red Eye any longer, but I'll have to check in once in a while. You'll do great! I am so excited for you, good luck! Way to go Joelen!!! Good Luck! Woo Hoo!!! Go Joelen!!! You are currently a 2:1 favorite to win it all!! I'll have a little chat with Rick, if you know what I mean, wink, wink, nudge, nudge!! Wow, what a cool opportunity! It sounds like so much fun too - good luck! !